Kellisa wasn’t drinking and her only fluid intake was through the limited food she was eating. There was only so much pudding we could force into her mouth. She wasn’t thriving and required surgery to place a G-tube in the summer. With a G-tube, we would be able to give Kellisa the fluid she needed and prescription formula would guarantee she would receive all the nutrition required to start growing. Of course, Kellisa suffered from complications that required a second surgery to remove the original G-tube and replace it with another. The doctor had been placing G-tubes for 26 years and Kellisa was the first patient to ever require a second surgery. Kellisa was an expert at confusing doctors. Both of Kellisa’s hips had become dislocated. Her hip bones needed to be cut and put back in place with screws and plates. Even with pain medications, Kellisa was in almost constant pain as she spent most of the six week recovery period lying on a mattress in the middle of our living room watching The Wiggles while moaning in pain and discomfort. There was little we could do for her, except be there to hold her hand, stroke her head, and change The Wiggles videos every 45 minutes. Kellisa needed a rental wheelchair because she couldn’t bend her knees with the full leg braces she had to wear. 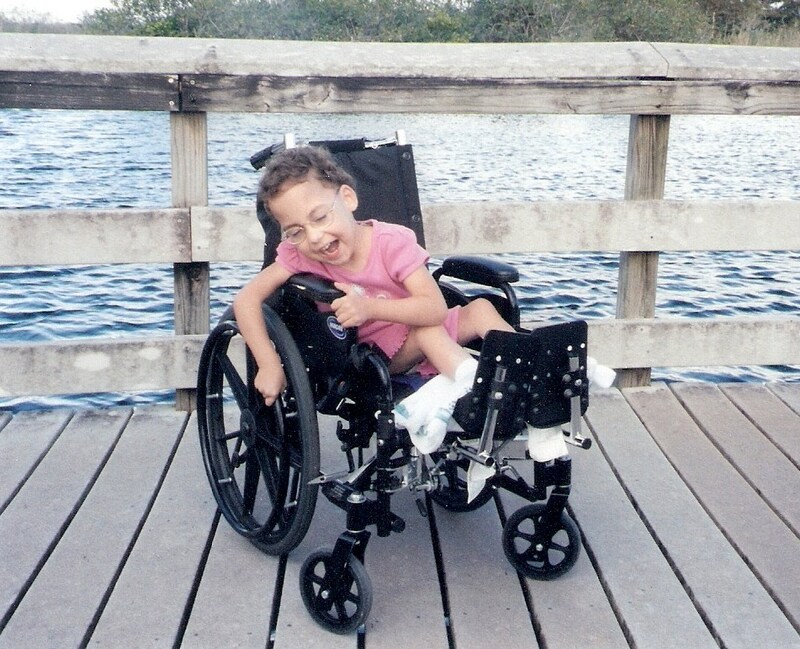 This wheelchair had wheels that Kellisa could use to propel herself. This was the first time Kellisa had the opportunity to wheel herself and she took full advantage. She was too small to reach both wheels at the same time, but she quickly figured out how to roll a little with one hand and then lean to the other side to wheel with the other hand so she could go straight. It was beautiful and Kellisa’s been non-stop wheeling ever since. 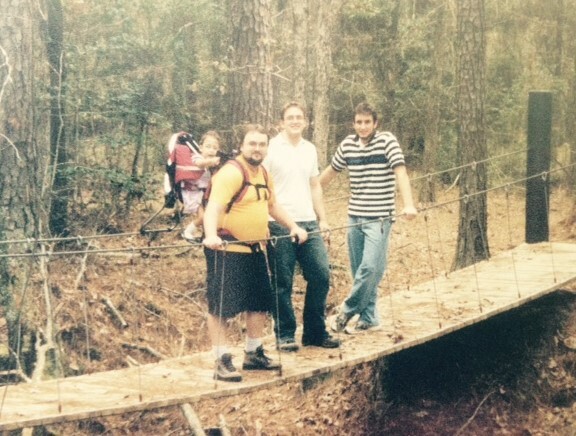 2003 was a rough year as we entered November. For the first time, I was worn down and desperately needed to recharge. 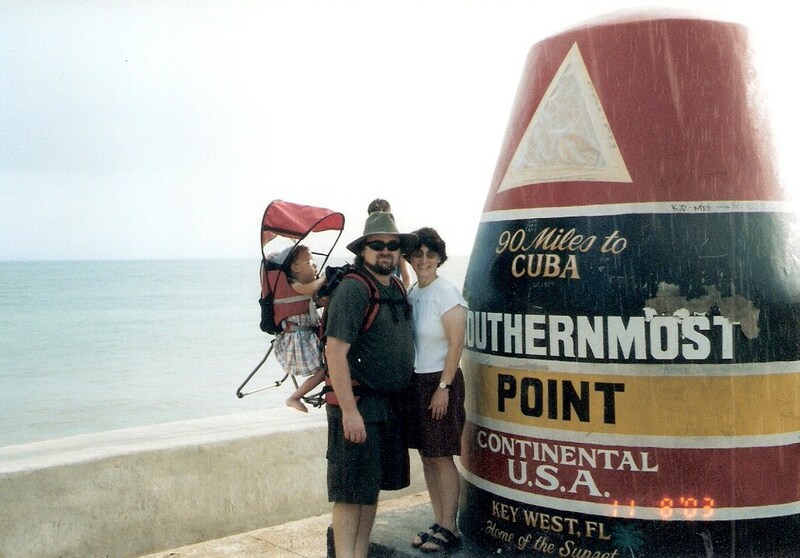 Since moving to Florida, I had dreamed of driving to the end of the road in Key West. Just north of the Keys, Everglades National Park is a huge green spot on the map with another road that ends at the water's edge. Without much planning, we bought some camping equipment, loaded up the van, and drove south. Not counting our trips back to Chicago to see family, this was our first vacation since Kellisa was born. We camped through severe thunderstorms in the Keys and visited the southern most point in the United States before watching a famous Key West sunset. The highlight of the Keys for Kellisa was a very rough glass bottom boat ride over the reef. Kellisa was rudely welcomed in her first national park by relentless mosquitoes. We spent most of our visit enjoying the vast landscape from the safety of our van. We had no idea at the time, but this would be the start to a love of visiting national parks.